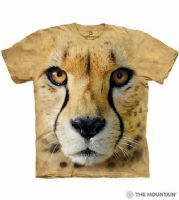 This beautiful big face t-shirt design features the face of a Cheetah. This big cat is based on one of the cheetahs at the Smithsonian Institute Zoo. The tee is unisex so suitable for men and women. Did you know? The cheetah is the world's fastest land animal. They can run 70 mph, which is as fast as cars drive on the highway.